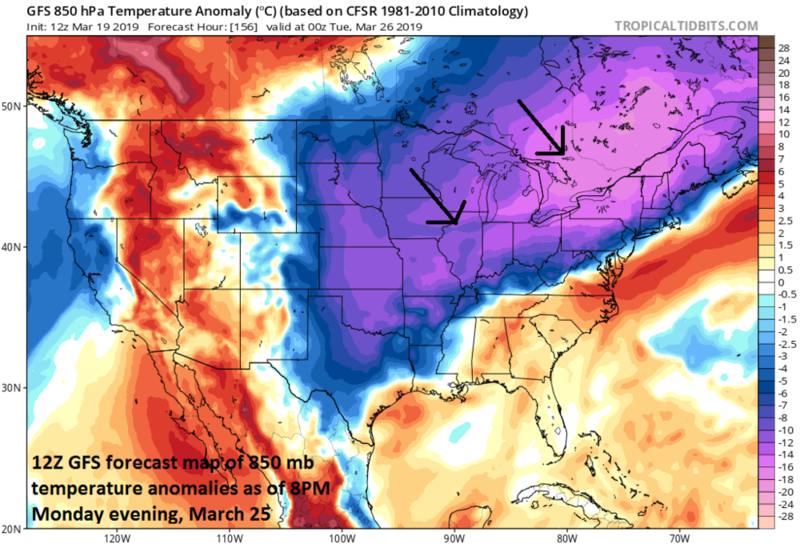 Even though spring “officially” gets underway on Wednesday, there are still plenty of cold air masses around the northern hemisphere and – if the timing is just right – there can be some significant wintry weather in the Northeast US and even in the Mid-Atlantic region in coming days. This time of year is notorious for slow-moving and powerful storms and there are signs that two such systems may have an interaction with some impressive cold air outbreaks. The first event of interest will take place from Thursday into Friday and it will actually feature two separate strong waves of energy in the upper atmosphere. Soaking rain is likely to take place on Thursday in the DC-to-Philly-to-NYC corridor as a result of the first wave of energy and then the second wave will combine with an Arctic frontal system on Friday to generate windy and cold conditions in the Northeast US/Mid-Atlantic and likely numerous snow showers - perhaps even some snow squall activity. Another strong and slow-moving system will cross the country this weekend and potentially arrive in the Mid-Atlantic region early-to-mid next week at the same time another cold air mass dives southeastward from central Canada towards this region. It looks like this rather volatile weather pattern with strong and slow-moving storm systems will continue into the early part of April along with up and down temperature swings. 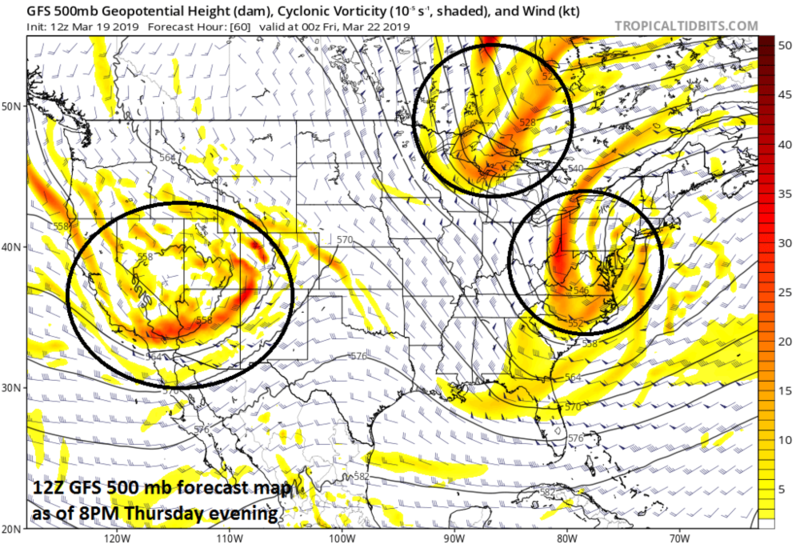 Low pressure supported by strong upper-level energy will intensify on Thursday along the Mid-Atlantic coastline and likely result in a soaking rain event for DC, Philly and NYC. At the same time, a cold air mass will be dropping southeastward from Canada and towards the Northeast US. This colder air will get wrapped into the low pressure system and the rain can very well changeover to snow in some interior sections of the Northeast US from upstate PA to New England. On Friday, a second strong wave of energy in the upper atmosphere will drop into the Northeast US and accompany an Arctic frontal boundary zone. The result of this will be quite an unstable atmosphere with windy and cold conditions and there are likely to be numerous snow showers in the Northeast US and Mid-Atlantic region - perhaps even some snow squall activity. The cold will stick around in the Northeast US and Mid-Atlantic region as we begin the weekend and it could be very cold across interior (and perhaps newly snow covered) interior New England. The chill will ease noticeably on Sunday in the Mid-Atlantic region and an influx of milder air can bring temperatures back to the 60 degree mark for highs in parts of the I-95 corridor. Another strong wave of energy in the upper atmosphere will move from west-to-east across the country this weekend and likely result in a strong surface low pressure system early next week with lots of available moisture. The moisture from this system could reach the Mid-Atlantic region in the early-to-middle part of next week at just about the same time another cold air mass drops southeast from Canada and into the region. If the timing is just right, the interaction of this moisture and fresh cold air mass could result in wintry weather for at least some sections of the Mid-Atlantic and Northeast US. There is plenty of time to iron out the details of next week’s threat and there is always the chance that this low pressure system is actually suppressed to the south and east of the Mid-Atlantic region as it could follow the passage of cold frontal system.